BEIJING -- The deal will lift a ban on American imported beef in China that was imposed in 2003 over mad cow disease concerns. A new China-U.S. trade deal will help sate the growing Chinese appetite for beef and allow more natural gas imports to fuel the country's expanding economy, but it steers clear of bigger issues that would have more substantial impact on the U.S. trade deficit. The agreement announced on Friday Beijing time appears a step toward easing discord between the world's two largest economies. Tensions have been stoked by President Donald Trump's aggressive rhetoric against Chinese exports and barriers to U.S. goods and investment. It also suggests still wider room for compromise. The last item of 10 listed in a joint statement says a U.S. delegation will attend an international gathering in Beijing, beginning Sunday, that will showcase a plan by President Xi Jinping to invest in vast networks of ports, railways and roads in a bid to expand China's trade with Asia, Africa and Europe. 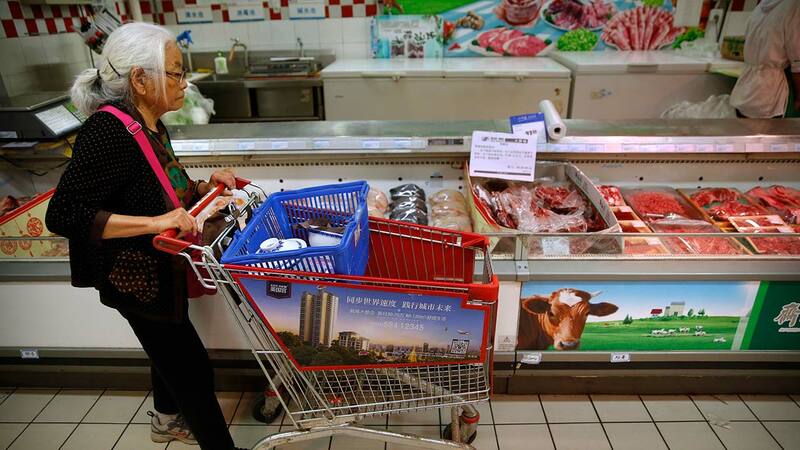 The decision to lift by no later than July 16 a ban on imported American beef imposed in 2003 over mad cow disease concerns is good news for Chinese consumers, said Peking University professor Yu Miaojie. Homegrown cattle herds are not keeping pace with the rising demand in the increasingly prosperous country. In turn, China will be able to send cooked poultry to the U.S. once the two sides resolve "outstanding issues" - mostly related to concerns over safety and hygiene. On a more symbolic level, the deal reflects the positive tone of relations between Chinese President Xi Jinping and Trump since their first face-to-face meeting last month in the U.S.
"China is willing to cut the trade deficits with the U.S. in order to avoid trade frictions between the two sides," Yu said. The new deal does not touch on issues such as Chinese exports of steel and aluminum that are a growing source of discontent over trade. America's trade deficit in goods and services with China totaled $310 billion last year, by far the largest imbalance with any country. The deficit with China represented about 60 percent of last year's total deficit of $500.6 billion. Spurred by beef's rising popularity, particularly in urban areas, China's 1.37 billion residents are projected to eat roughly 17.6 billion pounds (8 billion kilograms) of the meat this year, according to the U.S. Department of Agriculture's Foreign Agricultural Service. That's up more than 40 percent in the past five years. Yet beef exports alone will do little to fill the trade gap. Total global beef exports from the U.S. totaled $6.6 billion in 2016, according to the U.S. Meat Export Federation. How much that could increase with access to China is uncertain. Its import market is currently dominated by Brazil, Uruguay, Australia and other nations with meat that's generally cheaper than North American beef, according to the Foreign Agricultural Service. Li Suling, 55, who works for an airline in Beijing, said allowing American beef imports was "a good thing" because it's more tender than Chinese-raised beef and less of a safety issue. But Sun Lin, a 33-year-old chef at a high-end Beijing hotel, said he viewed the trade deal as merely a diplomatic gesture. Chinese consumers are becoming more sophisticated, Sun said, prompting restaurants to seek out and use more tender cuts of Chinese beef. "I think people are coming to realize Chinese beef isn't necessarily worse," Sun said. For exports of gas, the U.S. will now treat China "no less favorably" than other countries for which is does not have a free trade agreement, according to a joint statement released by the sides. Gas exports to such countries are not allowed without U.S. Department of Energy signoff under longstanding U.S. law. Approval still would be needed for China and there's currently little infrastructure along U.S. coastlines to allow for overseas gas shipments. As a result, economic benefits to U.S. energy companies would not immediately materialize, said Jake Parker, vice president of the U.S.-China Trade Council. Chinese officials lavishly praised their U.S. counterparts over Friday's deal, saying the agreement resulted from "intimate" cooperation. Vice commerce minister Yu Jianhua, one of China's top trade negotiators, was effusive in his description of the U.S. administration, something not often heard from Beijing. "Although the U.S. team is new, they've settled in quickly and (their) adaptability is very strong," Yu said. "They have a great professional spirit that's worth studying." Underscoring the shared emphasis on cooperation, the Trump administration's delegation to the Beijing conference is to be headed by Matt Pottinger, a special assistant to the president and senior director for east Asia at the National Security Council. Associated Press Matthew Brown, Gerry Shih and news researcher Yu Bing contributed to this story.